It is possible to find images in Images Mode using the Find Image tools located in the image corrections toolbar. A subject's image or images can be located by entering any data that will identify that subject. To this end a "Find subjects via..." drop down is available listing all the subject fields. To avoid the possibility of finding the wrong subject it is recommend the unique field is used for this purpose. When using a non unique field such as "name" care should be taken to ensure the correct subject has been found. The subject may also be found by scanning the /%S (find subject) barocde commonly used in the photographer programs, CapturePost, DataPost, PackBuilder and CompositeBuilder. When scanning a /%S barcode it is not necessary to select a lookup field or place the cursor in the lookup window. An image may be located independantly of subject data by entering either it's image number, full filename with extension or tag (filename without extension). Note: When finding images make certain an appropriate filter is selected for the images. For example if the filter is set to display only a particular folder eg 8A, it cannot find an image belonging to another folder. For this reason it is recommended when finding images the filter is set to "All"
Select whether to find the image by number or tag. When searching by filename select the tag option. Enter either the image number, filename or tag. An image may also be found by scanning a /%I/ (find image) barcode. (See The /%I "Find image" barcode) When scanning a /%I/ barcode it is not necessary to select a look-up field or place the cursor in the entry window. 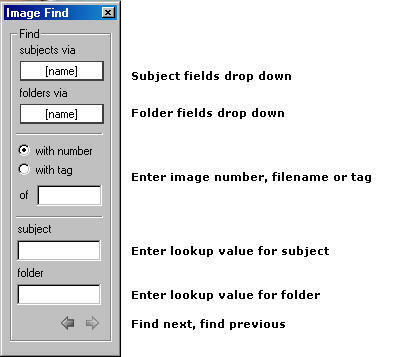 Images matched to folders may be found by entering the folder's name in the folder lookup window.